PORTLAND -- Less than two hours before a TD Bank near the Maine Mall was robbed Thursday night, Waterville resident Jamilee Kus' cellphone sent a text message asking the recipient to check the branch's hours. PORTLAND — Less than two hours before a TD Bank near the Maine Mall was robbed Thursday night, Waterville resident Jamilee Kus’ cellphone sent a text message asking the recipient to check the branch’s hours. Anonymous tips, surveillance images and help from Kus’ cellphone provider led authorities to the woman early Sunday morning. She was arrested on the Maine Turnpike in Scarborough after police stopped the vehicle she was riding in with her two children, ages 4 and 10, a female friend and her boyfriend. 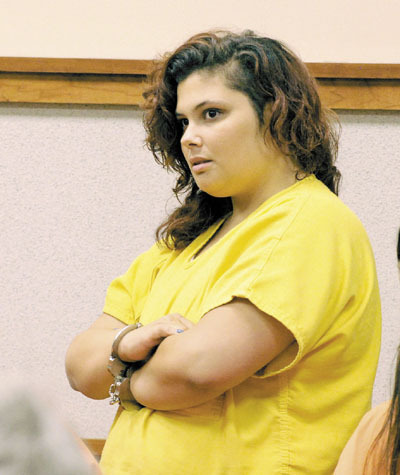 Kus, 28, made her first court appearance to face charges of robbery and theft Monday. Documents released after the proceeding provided additional information about the robbery and how police came to arrest Kus. A woman went into the bank at 250 Maine Mall Road in South Portland around 7 p.m. Thursday. She told the tellers to put their hands up and said something along the lines of “I’m not playing with you, give me your money” and “There are people outside waiting for me,” according to an affidavit filed by Chris Todd, a South Portland police detective. One of the bank employees said in a statement that the robber held out one hand as though she was holding a gun, but her sweatshirt sleeve was pulled over the hand. The employee also wrote that the robber had a blue latex glove on one hand. No customers were in the bank at the time. The tellers gave the woman a total of $1,860, which she put into the pocket of her hooded sweatshirt after demanding a bag and being told there weren’t any, according to the documents. The woman ran to a white sport utility vehicle. On Friday, after media outlets showed a surveillance image of the robber, a caller told South Portland police that the woman was Kus. The caller said Kus has two young children, drives a white Ford Explorer, is well known to Waterville police and has a drug problem, according to Todd’s affidavit. Additional tips that Kus was the suspect followed. Waterville police Sgt. William Bonney also told Todd that the suspect appeared to be Kus. Bonney said that to have robbed a bank without concealing her face, Kus could have been on drugs or extremely desperate. Police had Verizon Wireless track down the location of Kus’ cellphone. Verizon notified police that the phone was in the Bronx, N.Y., and provided the text messages from before and after the robbery. It wasn’t known who got the messages. On Saturday night, police got a tip that Kus was on her way back to Maine from New York and expected to be in Waterville by midnight. Verizon told police that her cellphone was in Groton, Conn.
South Portland officers went to the York toll plaza and the Kennebunk rest stop on the Maine Turnpike. When the SUV passed the rest stop, Todd notified state police, who stopped the SUV north of Exit 42 in Scarborough. Kus denied being involved in the robbery and said she was not in the Portland area Thursday, according to Todd’s affidavit. She said Verizon’s records, which included the phone’s location in Portland’s Monument Square 15 minutes before the robbery, must have been wrong. A search of the vehicle turned up blue gloves, which Kus said may have belonged to her father, who is a mechanic, according to the affidavit. The robber was wearing black sneakers with white soles, and a search of the SUV turned up a pair of black Nikes with white soles. Kus said they were hers, the document says. On Monday, Kus appeared before Superior Court Justice Thomas Broderick in yellow jail clothes, her hands cuffed in front of her. She tried to shield her face from a news camera with her hands, and by hanging her head low while waiting for her turn. Broderick set her bail at $5,000 cash. Assistant District Attorney Tracy Leadbetter had asked that bail be set at $100,000 worth of property or $50,000 cash. Luke Rioux, the lawyer appointed to represent Kus for the day, asked for bail of $1,500 to $2,500. He said Kus has lived in Maine her entire life and has worked in a booth at a hair salon for about six years.